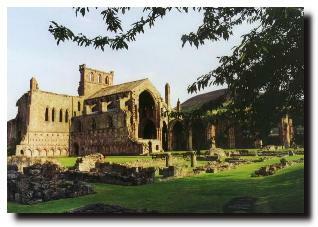 But the peace of the abbey was shattered in 1296 with the invasion of Scotland by King Edward I of England and again in 1322 when Edward II sacked the building. 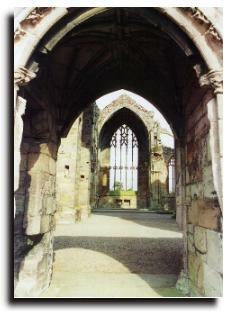 Robert the Bruce assisted in the rebuilding of the abbey. 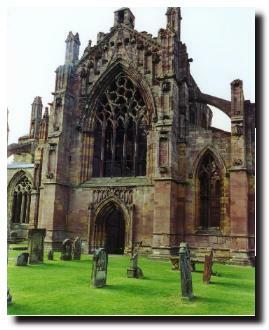 Although King Robert was buried at Dunfermline Abbey, his heart was buried at Melrose Abbey (though some chroniclers claim that it got there only after Sir James Douglas failed to take it to the Holy Land). 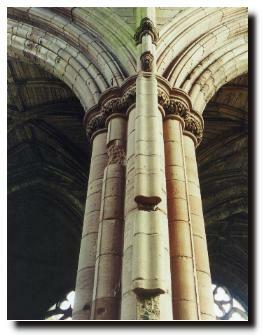 Despite the centuries of neglect, there are soaring, decorated arches, vaulted ceilings, elegant tracery on the south transept and many carvings (some of which are humorous - like the pig playing the bagpipes and the grumpy fellow bearing the inscription "He suffered because he himself willed it"). 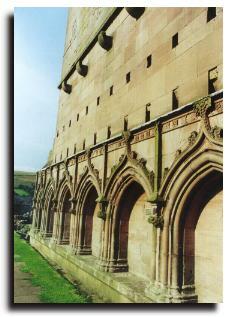 And Robert the Bruce's heart, reburied on 24 June 1996 (the anniversary of Bruce's victory at Bannockburn in 1314) now has a plaque with an inscription from Barbour's "The Brus" reading "A noble hart may have no ease, gif freedom failye" Translated, this means "A noble heart cannot be at peace if freedom is lacking" It incorporates a carving of a heart entwined in the Saltire, the basis of Scotland's national flag.